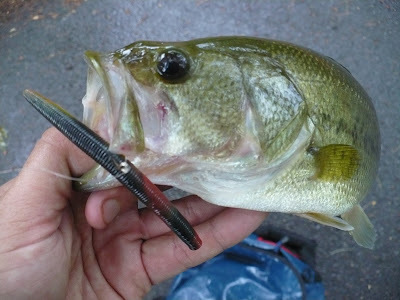 This Union County Largemouth preferred the sweet potato pie Tiki-Stick. Moon: Waxing. 4 days after new. Since the fish were biting the Tiki-Sticks in the river on Tuesday, I figured the ones in the nearby pond might be fooled just the same. It took me awhile to locate one, but I was successful in bagging a bass. I've watched the movement of the bass in Rahway River Park Pond over the last several months. I caught fish in the shallow end of the lake in the Spring, and they've since migrated to deeper water; just like bass should. It feels strange walking past half-a-lake's worth of lily pads and solid structure, but from observations and trial and error, I can confidently say they're no fish there. Shallow flats are a great place to look for bass in the early Spring, as this water warms first and is more comfortable for them than the chillier depths. However, at some point the temperature in these shallows exceeds the upper threshold for a bass and they return to the deeper, cooler water in the summer months. The end of the lake where I caught fish in the Spring now has a ton of lily pads, and I suspected that the growth along with the warmer temperatures has depleted the oxygen. I figured the fish were elsewhere. After not seeing much life or catching a fish on a handful of outings, I now walk right past this area, and inevitably hook a bass in the deeper water. To back-up my observations, the entire time I was fishing at the pond on Tuesday, a cool rain was coming down. When I was leaving, the shallow end of lake, and only the shallow end of the lake had steam coming from it. This was my proof that the water in this area is considerably warmer than the rest of the lake and is a huge part of the reason it's devoid of fish. For the rest of the summer, I won't hesitate walking past all that good-looking bass structure. I'm always tempted to pitch my baits under the trees, next to the lily pads and to the side of the logs, but I'm sure that I'd be better off going where the fish are. Next Up: Not sure today, but the Calcutta is spooled with 50-pound braid and the Stradic is spooled with 20. The New Jersey Esox Weekend Hatrick attempt starts tomorrow on the Passaic River.